My list of things to buy in Florida this time was quite precise. And I pretty much stuck to it too, which makes a nice change! One of the things on the list was a pair of denim shorts - y'know, go anywhere, everyday shorts. Sounds pretty simple, right? 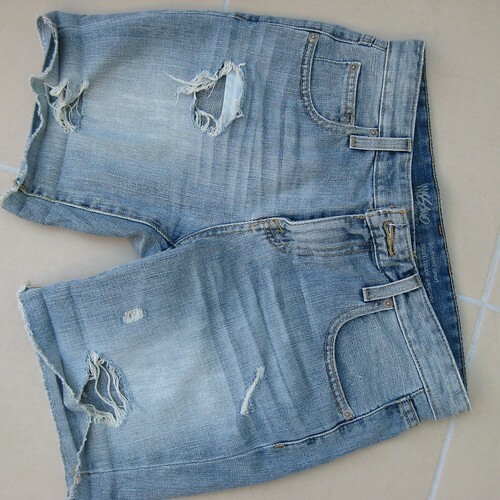 There are many, many pairs of denim shorts available to buy in Orlando. The small catch is that I am 160cm and have a current fighting weight of around 49kg (5' 3" and around 108lbs or 7st 10lbs in old money). This is not a size that appears to be that common for adult women in Orlando. I may have found an entire floor of Macy's that had precisely nothing in my size. So a lot of the time this reduces me to looking for stuff in the more teenaged end of the market. 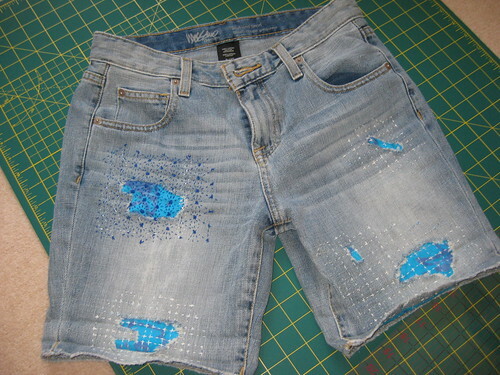 Teenagers appear to like denim shorts, but (as I did when I was a teenager) they like them with holes in. The thing is, now that I'm 37 I prefer my clothes to cover me. Pretty much, anyway. And I've worn enough holey jeans to know that those white threads they leave are really fragile, and get really matted when you wash them. But I've been wanting to try sashiko - a Japanese stitching technique that started out as a way to patch denim - for ages, and the pair of jeans I've been waiting to disintegrate are really a bit too big. So this suddenly seemed like the perfect opportunity. I ended up with a cheap pair of holey jeans from Target, where the holes appear to have been carefully rubbed only on the front and the rest of the denim is really sound. I have no idea why anyone would want to have a hole over the bottom of the pocket. I don't get why those super short cut offs leave the bottom of the pockets sticking out either. I am clearly not down with the kids. Much fun marking out and stitching later, I have ended up with something I'm pretty pleased with. I mean, clearly it's not perfectly even. And I ran out of the dark blue thread before I'd quite finished on that big hole on top of the right leg. But I've already worn these quite a lot for gardening, they have survived washing with no noticeable harm, and my pocket is no longer hanging out. I reckon that's a pretty good win!